May 9: Photographed from a window yesterday in Bloomington, Minn.
May 7: Perfect day for a long walk in Minneapolis. I shot this photo in Loring Park. That’s the always impressive Basilica of St. Mary in the background. Spring is in the air! May 6: Walked around Lake Bde Maka Ska (the former Lake Calhoun) in Minneapolis today. I’m finally convinced spring is here. May 1: Like many if not most cities, Bloomington, Minn., is home to a wide variety of wildlife. We have the usual squirrels and rabbits and the occasional coyote. But it’s the birds I enjoy most. The migrations north seem to be mostly complete, although the humming birds have yet to arrive. Which brings me to this guy who showed up yesterday on the roof of our next door neighbor’s storage shed. I snapped the picture moments before it departed. A crane or turkey, perhaps? Anyone know? April 30: Seen tonight over Bloomington, Minn.
April 27: Twin Cities weather advisories have switched from snowstorms to floods. I took this picture of the raging Mississipi River yesterday from the Stone Arch Bridge in Minneapolis. April 26: It will be full over Bloomington, Minn., on Monday. I shot the photo yesterday afternoon with a Nikon COOLPIX B700 camera with a 4.3 to 258 mm zoom lens. As a Canon guy (except for an antique Nikon film camera I still occasionally use), it’s the only Nikon I own. It’s a light and compact — great for casual travel, sports, street and wildlife photography. April 24: This pair of mallards has been enjoying the snowmelt in our backyard in Bloomington, Minn.
April 23: The scene last night as we waited in Minneapolis for our light rail train back to Bloomington. April 23: That pesky Norwegian troll is back, this time on the hood of my car. April 21: This was the scene today at Hylands Lake Nature Preserve not far from our place in Bloomington, Minn. The walkers and birdwatchers were out in force, along with photographers like me. April 21: Street photography, Minneapolis, taken April 19. April 20: I snapped this photo through a window yesterday from the light rail train on the way with Dorette to the Minneapolis-St. Paul International Film Festival. We’ve lived in Bloomington for quite a while now but have yet to experience this interesting looking joint. It’s on our summer must list. April 16: Dammit! I should have known. A Norwegian troll was responsible for the recent blizzard in Minnesota. He was back at our place in Bloomington this morning to laugh at and mock me. April 15: This dark-eyed junco, like most of us today in snow-laden Bloomington, Minn., having a “WTF?” moment and in its case wishing he’d delayed his arrival in our yard for a couple of weeks. April 14: The view at our place in Bloomington, Minn., at 5 p.m. today. More snow on the way. 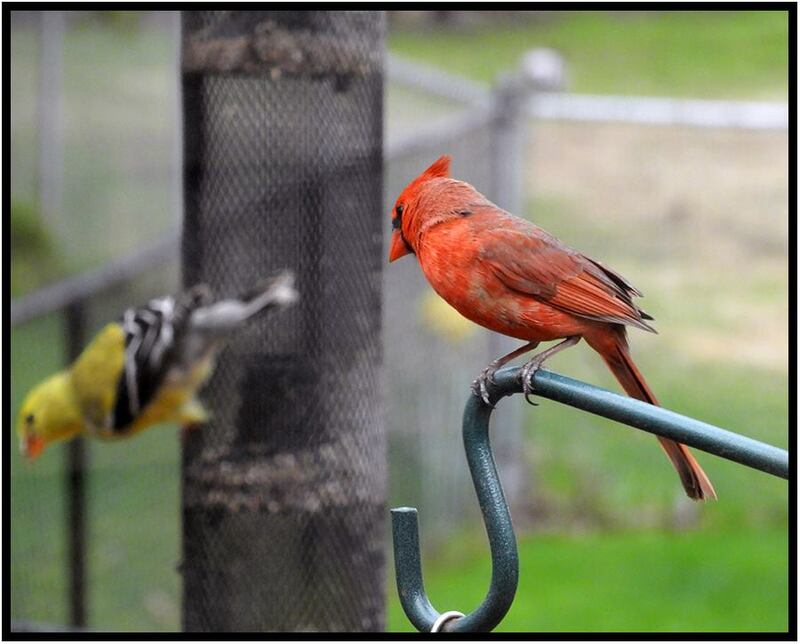 April 11: Action like this at our feeder in Bloomington, Minn., often occurs before a negative change in the weather. I wonder if these guys know something we don’t? April 5: Here are the most recent birds to visit us in Bloomington, Minn: a pair of mourning doves. Can the robins and humingbirds be far behind? My bird book says doves are “partial migrators” to Minnesota. That is to say, the smart ones spend the winter in the Southern states. April 4: I guess I wasn’t surprised this morning to see that this backyard squirrel made it through the nasty weather we’ve just experienced in Bloomington, Minn.
April 2: Say hello to Mr. and Mrs. Cardinal. They were at our feeders this morning, gorging themselves in preparation for the two-day winter snow “event” approaching Bloomington, Minn.
March 31: The moon tonight seen over Bloomington, Minn.
March 25: White Bear Lake. I took this picure today. The lake is still frozen but looking good in the late winter light. There was even a partial moon in the sky. March 24: No, this is a shot of the sun through the clouds taken while walking Pixie this morning. I darkened the image slightly for effect with Photoshop. Disclaimer: Do not shoot pictures of the sun if it is not mostly obscured by clouds. Many people have damaged their eyesight by doing so during solar eclipses. One last note: This is a color photograph not converted to black and white. March 20: I suspect this is the male cardinal and partner of the female that has been frequenting our feeders. I’d worked myself into a snit about the unfairness of snow falling in Bloomington, Minn., on the first day of spring. But not so much now. Spring has finally sprung in the Midwest, as Bloomington, Minn., photographer Dave Vorland’s most recent images show. But it hasn’t been like that since its start March 20, when the landscape was snow-filled and trees were bare. Nicely done, Dave! Great subjects, well composed, well shot. Thanks for sharing.